Here in Washington we’ve been hit with Snowpocalypse. Days of snow, frozen roads, and heavy winds. For those of you in colder parts of the country, our declared state of emergency is probably amusing. But we don’t normally get weather like this, and don’t have the infrastructure to deal with it. Store shelves were wiped out, and people were acting like they’d be trapped for weeks. Having the kids home for days on end has definitely been tough on our work schedule. Throw in some serious winter colds, and we’re all a bit stir crazy. Fortunately, I have a few tricks up my sleeve to help relieve the cabin fever. From sensory bins to bath paint and slime, I’ve tried to keep the kids busy. But the biggest hit has definitely been the ice balloons. FOR MORE FUN WITH ICE, CHECK OUT OUR DRY ICE BUBBLES EXPERIMENT! But I was able to take the magic even one step further with these beautiful colorful ice balloons. 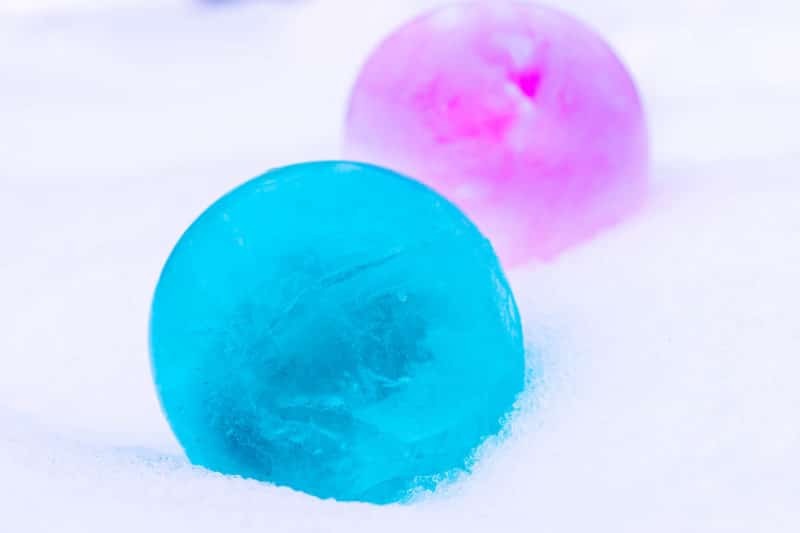 Ice balloons are simply frozen water balloons. 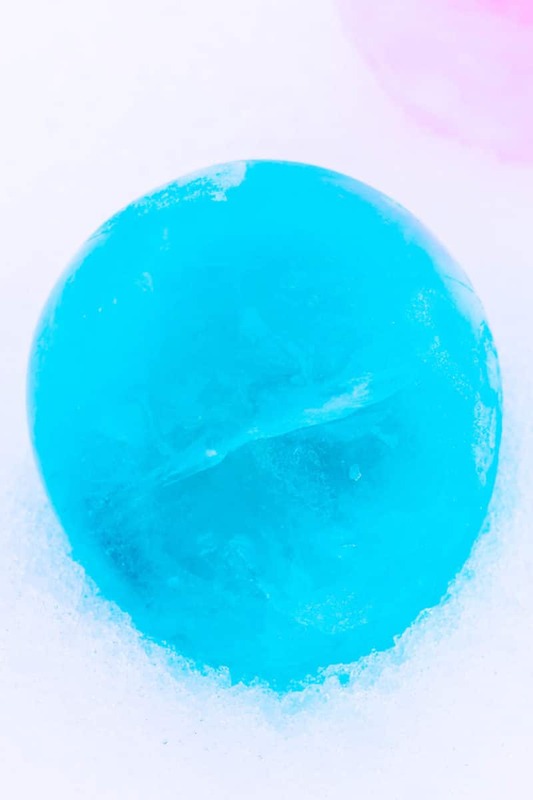 You peel the balloon away, and are left with a lovely solid ball of ice. I decided to up the magic factor by making the kids one in each of their favorite colors. I placed the peeled ice balloons out on top of the snow for the kids to discover. After holding and marveling over them, the kids turned them into a treasure hunt game. 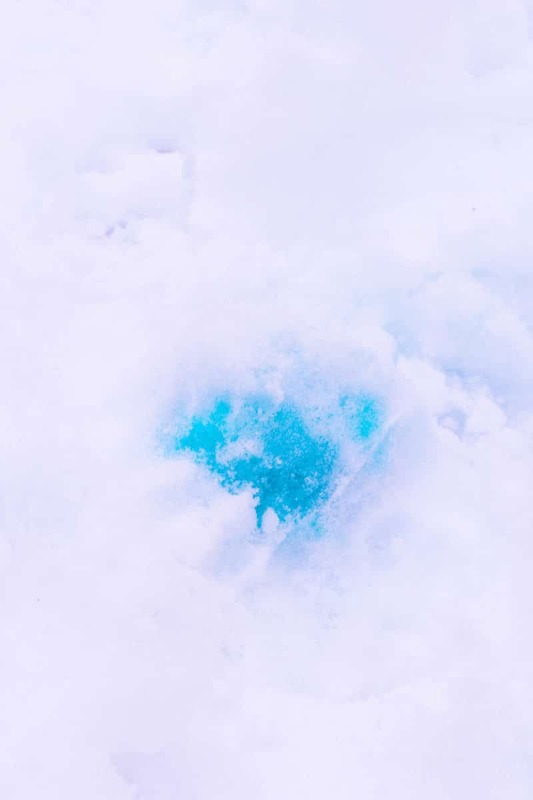 They took turns burying the balls of ice just deep enough to see a splash of color. Then the other kid would try to find them. LOOKING FOR MORE OUTDOOR ACTIVITIES? PRINT OUR FREE NATURE SCAVENGER HUNT! 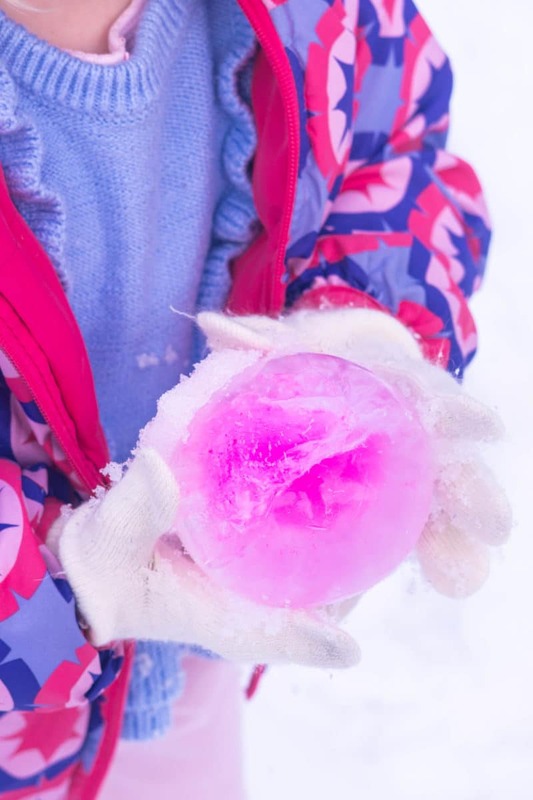 Ice balloons are a lot of fun to play with in the snow. But you can make them anytime of year in the freezer as well. 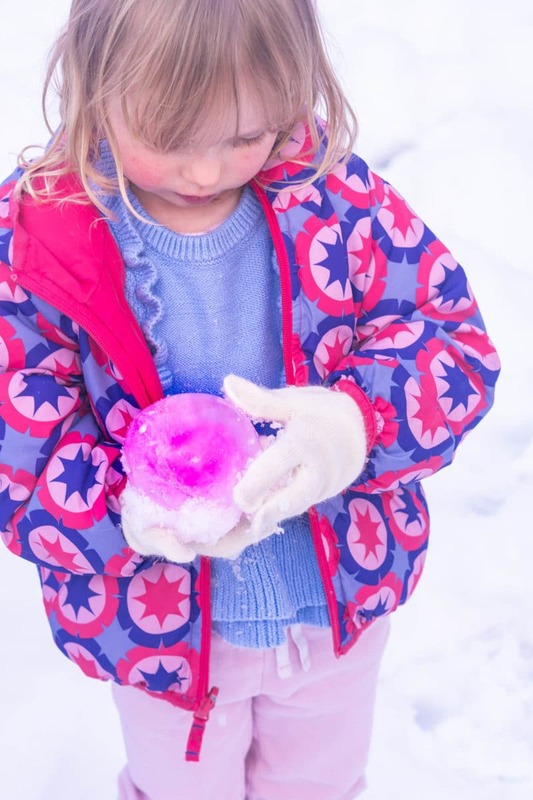 Here’s how to make ice balloons for your kiddos. Place the end of a 7″ balloon over your faucet. Fill with cold water until it is full about 3″ in diameter. Pull the end off of the faucet and hold it open. Drop a couple of drops of liquid food coloring into the water in the balloon. 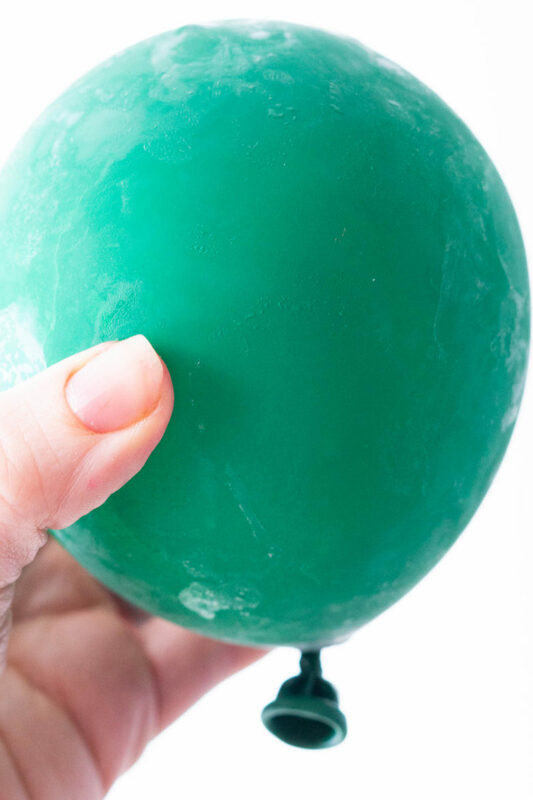 Tie the balloon and give it a few shakes to mix the color in. If it’s below freezing outside you can place the balloon in the snow overnight. Or place the ice balloons in your freezer for 12 hours. I checked on the ice balloons a few times in the freezer to make sure they were freezing evenly without a flat side from sitting on top of the ice cream carton. 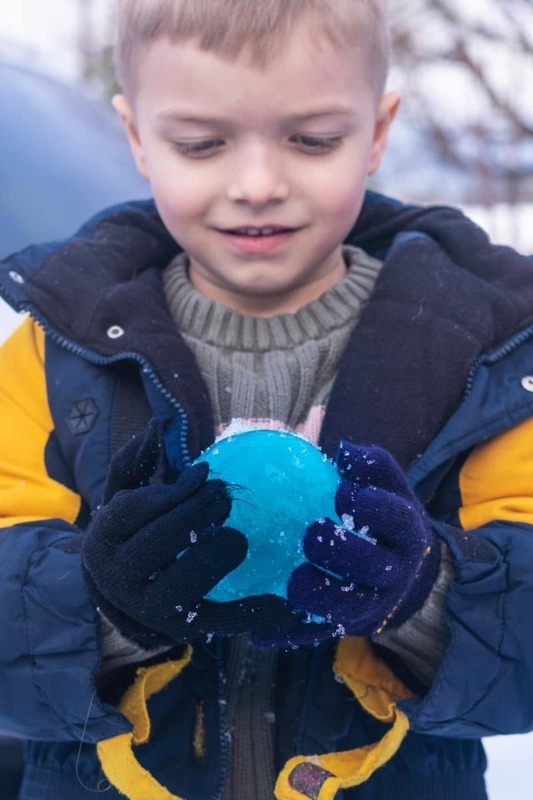 If you love opportunities to teach your kids, freezing ice balloons is an easy way to teach about water and freezing temperatures. Try making a few different balloons and putting them in different places. Put one in the freezer, one in the snow, and one outside but not in the snow (maybe a covered porch). Take temperatures in each location and time how long it takes each ice balloon to freeze. 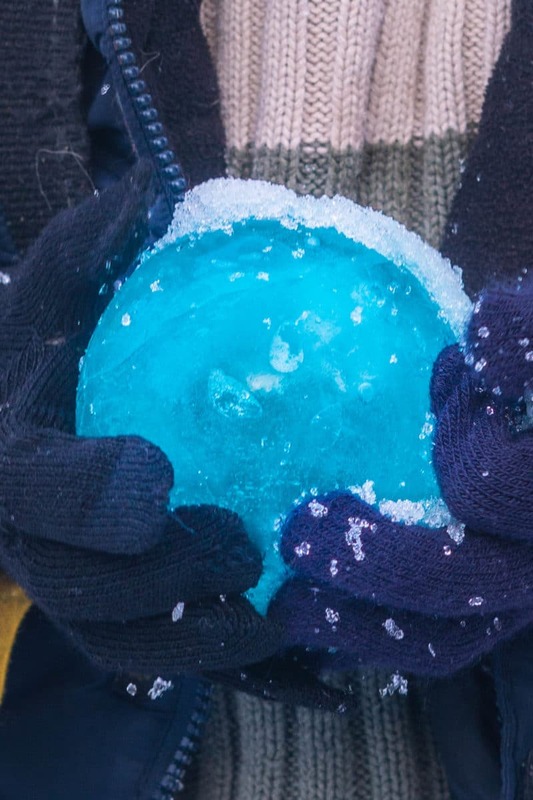 Have the kids describe the ice balls. How do they feel? What do they look like? What shape are they? Do they roll? Are they heavy or light? 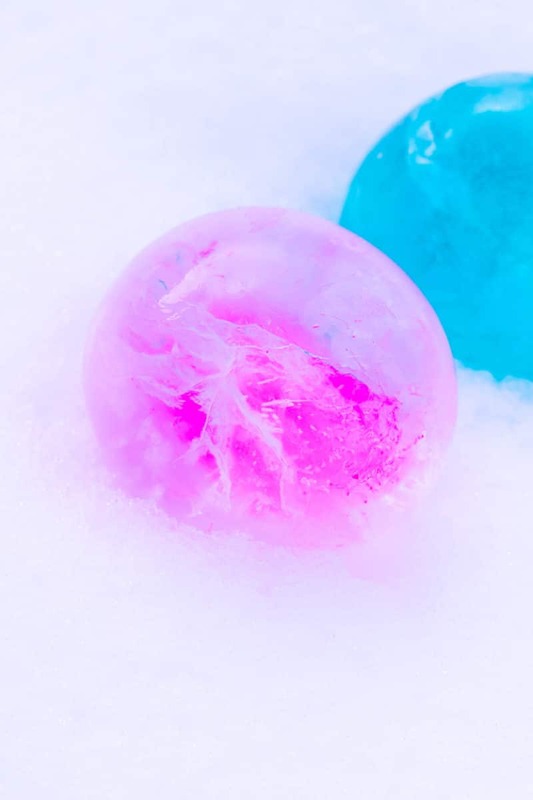 You can also bring the ice balls inside to let them melt in a bowl. Time how long it takes for the water to return to its previous state (liquid). Don’t lose this idea! 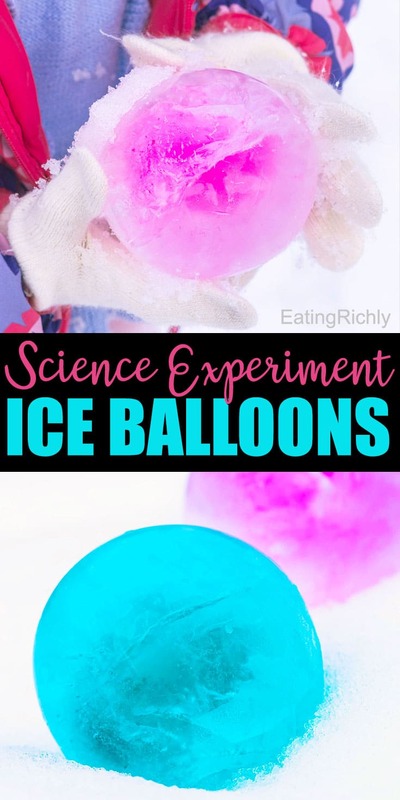 Pin to save, and then leave a photo in the comments of the pin when you make your own frozen ice balloons. We’d love to see how yours turn out!